A recently published research paper may prove to be of great interest to marketers. 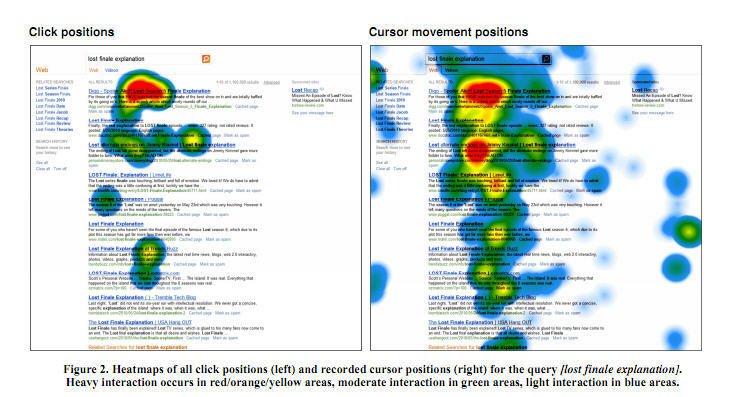 “No Clicks, No Problem: Using Cursor Movements to Understand and Improve Search,” by Jeff Huang, Information School University of Washington; and Ryen W. White and Susan Dumais of Microsoft Research, takes a look at the correlation of eyegaze on a webpage and cursor placement. In this paper, we examine mouse cursor behavior on search engine results pages (SERPs), including not only clicks but also cursor movements and hovers over different page regions. We: (i) report an eye-tracking study showing that cursor position is closely related to eye gaze, especially on SERPs; (ii) present a scalable approach to capture cursor movements, and an analysis of search result examination behavior evident in these large-scale cursor data; and (iii) describe two applications (estimating search result relevance and distinguishing good from bad abandonment) that demonstrate the value of capturing cursor data. Jeff Huang, the team member who implemented and deployed the cursor tracking code, mined the cursor data, and wrote parts of the paper, took a few moments to answer several questions I had about this intriguing technology. Tell me a little more about this research. Jeff Huang: We examined mouse cursor behavior on search engine results pages, including not only clicks but also cursor movements and hovers over different page regions. In an eye-tracking study, we showed that cursor position is closely related to eye gaze. We developed a scalable approach to capturing cursor movements, and an analysis of search result examination behavior for over 300,000 queries from around 22,000 people. Finally, we were able to use cursor movements to estimate search result relevance and distinguishing good from bad abandonment. Marketers are probably familiar with click and heatmaps, and this seems closely related to that technology. Do you think this technology can be useful for more than search? JH: Cursor movements can create heatmaps with a similar appeal as click maps. While click maps show only the regions being clicked, movement heatmaps can also show regions that received attention by proxy of the cursor position. Often clicks are not available for smaller sites so movements can provide richer information. Could marketers utilize this tech for webpage research to improve, say, the eyepath of the page? 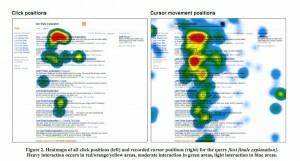 Is cursor movement correlated with a page visitor’s eyepath? JH: Yes, as we mention in the paper, the cursor is typically within 200 pixels of the eye gaze. The most common position for the cursor is to be slightly below what the user is looking at. We also found that the cursor follows the eye gaze by around 200ms [milliseconds] (although the data for this is highly variable). Does this technology offer other applications for marketing efforts or webpage testing? JH: Sure, having records of the cursor movements allow marketers to replay the user’s session on the Web page. For example, they can see which order a user filled out a form even if they did not complete the form and left the page instead. We have developed an efficient method to record the cursor movements so they take a minimal amount of space and can be collected without disrupting the user. Is this tech publically available, and if not, when is commercial roll-out expected? JH: This was developed as part of an internship at Microsoft Research last year, and deployed to internal users. I will return to Microsoft again this summer, but I cannot comment on its commercial availability. As the CEO of an Internet Marketing Company, I’d love to be able to implement this technology to improve the usability of our websites and client’s websites. Other than key-coding the links and using analytics we cannot tell where the user is looking, but with this technology we could improve conversions and results. The technology is certainly something any webmaster or marketer would love to use. The thing is, it doesn’t seem much different from the cursor tracking abilities of ClickTale or Mouseflow, already commercially available. I’d love to see a follow-up comparison. Just because you can measure the clicks and navigation (viewing)of a page on a website, does not predict human behavior. How do you know if a cursor is left on a page to be read or the user simply got up to get a cup of coffee and was distracted by a phone call? Am I understanding this correctly? Victoria — thank you for the question; and thank you Jeff for providing a response.